Once you arrive at today’s event, you will have the opportunity to visit with many of our pets. When you are holding any of our pups, please stay right at the puppy pen, do not wander off in search of family members or for any other reason. If you decide that you would like to submit your application, either ask the volunteer who is tending the dog, or talk to the volunteer staffing “the table” to help you setup an interview. One of our volunteers will review your adoption application and ask any clarifying questions. This interview DOES NOT guarantee that you will be approved for adoption. Please understand that there may be more than one application submitted for the same dog. We’ll do our best to let you know if there are any apps in front of yours, but sometimes, amidst all the chaos, we may not know at the time of submission. 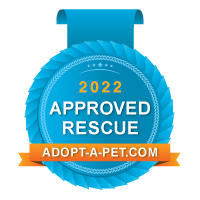 Once the adoption event is completed, all of the applications are presented to our review committee. We do our best to get through them quickly, because we know you’re excited. If, for some reason, your application is not approved, you will receive a notification via email. If you are approved, you will be notified by email, so please keep an eye on your email and respond to your confirmation email when it is received. Our process moves quickly, but there’s a lot to get done. If we contact you requesting additional information, please help us out by responding as quickly as you can. One item that comes up frequently is the requirement, if you are renting or living in a condo, to provide a copy of your lease or condo docs that shows you are allowed to own a dog. If this fits your situation, please begin the process of requesting the appropriate forms, if you don’t have them already.